MAD Museum’s Chazen Building, designed by Allied Works Architecture. Photo by Hélène Binet. MAD Museum of Arts and Design’s mission is to explore the craftsmanship and creative processes of contemporary artists and designers from around the world. Through its innovative programming, the Museum challenges traditional classifications and hierarchies that separate the arts according to medium, geography or chronology. With its focus on materials and processes, MAD instead places fine art, craft, decorative art and design along the same creative continuum. Museum of Arts and Design. 2016. Photo by Gustav Liliequist. Courtesy Museum of Arts and Design. 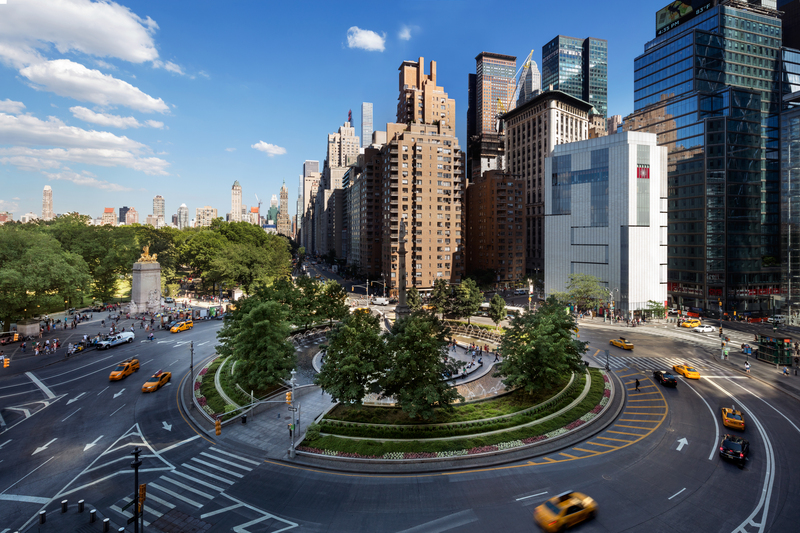 Allied Works’ design for the Museum’s new 54,000-square-foot home transforms the 10-story building at 2 Columbus Circle into a dynamic cultural center that furthers MAD’s institutional mission and engages the surrounding urban and natural environment. The design maintains the scale, height and form of the original structure—one of the few freestanding edifices in Manhattan—while dramatically opening up the once nearly windowless building to animate the Museum’s permanent collections, which thrive in natural light. “In this pivotal location, linking Midtown Manhattan, Central Park and the Upper West Side, the new Museum will actively engage its surroundings. Our goal was to maintain the building’s iconic presence while giving it new life as a contemporary cultural institution at the crossroads of the city. Our design opens the Museum to natural light and weaves the building back into the street life of the neighborhood, fostering a dialogue between the interior of the Museum and its urban environment.” — said Brad Cloepfil, Principal of Allied Works Architecture, 2007. Comprised of fritted glass and glazed terra-cotta tile, the building’s new façade reflects both the Museum’s craft tradition and its permanent collections. The building’s skin will be tiled with approximately 22,000 custom-made terra-cotta plates, finished in a light iridescent glaze that subtly shifts in tone depending on time of day and perspective. A series of three separate cuts—each one a continuous 30-inch-wide ribbon fitted with transparent and fritted glass, developed in conjunction with and donated by Oldcastle Glass—will weave across the building’s tiled façade to filter light into the gallery spaces and allow for spectacular views of the city. The interplay between the glass and the glazed tiles will create an elegant geometric pattern on the façade and will give the building a dynamic sculptural quality in distinctive counterpoint to the high-rises dominating Columbus Circle. The ribbons of glass that cut across the façade continue inside the building across the floors, ceilings, and walls of each level, creating visual connections among the galleries and providing visitors with a unified sense of space. Glass will encircle the entire ground floor, inviting a dialogue between the Museum and its surrounding neighborhood, and will stretch across the ninth floor of the building, giving visitors to the Museum’s restaurant a dramatic panorama of Columbus Circle and Central Park. ‘Studio Job MAD HOUSE’, 2016. Photo by Butcher Walsh. Installation view of ‘Japanese Kōgei | Future Forward’, 2015. Photo by Butcher Walsh. ‘Wendell Castle Remastered’, 2015. Photo by Butcher Walsh. ‘Against the Grain: Wood in Contemporary Art, Craft and Design’. Photo: Ed Watkins. ‘LOOT: MAD About Jewelry’, 2016. Work by Uli Rapp. A highlight of the MAD Museum is the Tiffany & Co. Foundation Jewelry Gallery, the nation’s first resource center and gallery for contemporary jewelry. Located on the second floor, the center organizes and presents jewelry exhibitions, includes publicly accessible study storage of the Museum’s entire jewelry collection and provides additional resources on the history of jewelry design through MAD’s online database. Sarah Zapata and Pam Liou demonstrating latch-hooking technique to visitors at MADmakes on 7.21.16. Photo by Kat Ryals. The entire sixth floor of the Chazen Building will be dedicated to education, marking the first time that MAD will have designated space for its popular education and public programming. The dynamic facility will feature classrooms and studios for master classes, seminars and workshops for students, school children, families and adults. Three open studios for ongoing artist-in-residence programs will engage visitors in the creative process of artists at work and enhance exhibition programs on the floors below. Lectures, films, performances and symposia related to the Museum’s collection and topical subjects affecting the world of contemporary art, craft and design will be held in a renovated 150-seat auditorium on the building’s lower level. Robert Restaurant. Photo courtesy of Robert Restaurant. Museum of Arts and Design. Photo by Eric Scott. The Museum of Arts & Design is the country’s leading cultural institution dedicated to the collection and exhibition of contemporary objects created in a wide range of media, including clay, glass, wood, metal and fiber. The Museum celebrates materials and processes that are embraced by practitioners in the fields of craft, decorative arts and design. MAD’s distinguished permanent collection includes more than 2,000 objects by renowned artists and designers from around the world, representing many forms of creative expression and technical mastery. Copy & photos provided by Museum of Arts & Design. Abridgment & format by Jeff Heatley / AAQ.